The recent floods have moved every heart in Pakistan and all over the world. While the philanthropists came forwards with everything they could afford, the ordinary people gave away their small but precious savings and the Army took over one of the biggest relief operations of its kind in recent times. The world community also came forwards to render a helping hand. Even individuals from China, Turkey, Kuwait, Saudi Arabia and many other countries came forwards donating generously to help the helpless. We as a nation are grateful to every heart that was moved by the sufferings of the devastated people. Like everyone, the artists of Pakistan also came forward to share the grief of their brethren in distress. “Sanjh” is one such collective effort of artists with a caring heart who got together to raise funds for the flood victims through an innovative way. 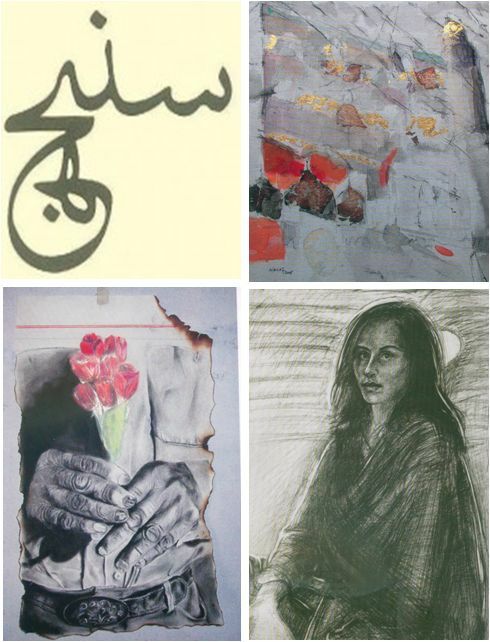 The initiative by Zahraa Assad Saifullah and Zahra Mirza of RetroArts in collaboration with Foaad Nizam of Danka, and Visual Artists, Imran, Sajjad and Usman have compiled a set of dozens of postcards carrying photos of paintings of volunteer artist. The funds so generated by the sale of these postcards will be used to help the needy at this time of their need. The effort has been supplemented by the University of Gujrat which rendered every possible assistance in printing the post cards by allowing the use of their state of art printing facilities. As for me, I am thankful to my friend Shirazi who introduced me to Mr Yaqoob of University of Gujrat, who has very graciously sent me this beautiful collection of post cards. At the same time I commend the efforts of Sanjh for helping the flood victims in its own way.